This project traces the history of the Halifax Explosion in 1919 and how it affected the city and Canada at the beginning of the 20th century. An original Halifax Herald newspaper from the following day will be presented as part of the project. 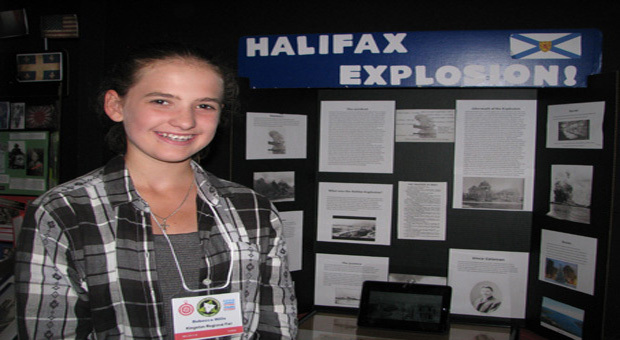 The Halifax Explosion was for many years considered the worst disaster caused by humans. It has been studied constantly by groups interested in creating a plan to deal with such disasters. The explosion shows the horrific effect such a disaster has on a community and also the heroic efforts of the police, the fire department and everyday people in dealing with such a disaster. The help delivered by officials and citizens not only from other parts of Canada but also from communities in the United States shows the cooperation between communities and countries in times of disaster. Canadians have learned and should continue to learn the importance of having a personal and government plan in place in case of a disaster. With advances in technology, Canadians increasingly have to deal with disasters created by train derailments, nuclear accidents, oil spills, etc. By learning from disasters such as the Halifax Explosion, we can be better prepared if a disaster happens in our community. Rebecca won the grade eight medal and represented the Kingston Regional Heritage Fair at the Ontario Provincial Fair in Toronto in June 2015.